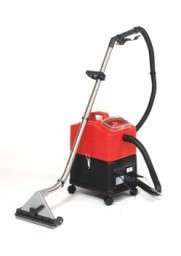 The Santoemma Sabrina Mini is a machine especially designed to clean smaller areas of carpet and upholstery. Despite its small size the Sabrina is a robust and powerful unit for professional use. The roto moulded tanks hold 14L each and are virtually indestructable. The Sabrina is provided with the wand for carpet and hard floor. The hand tool for cleaning upholstery and inside of cars is optional. Main application fields: hotels, private houses, offices, shops, rental companies, car washes, carpet shops and cleaning companies.